La belle France has been on my mind the last few days. 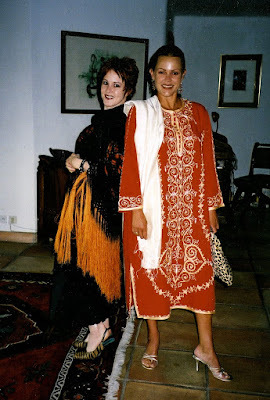 I finally watched "Coco Before Chanel" on Netflix this past weekend, The Style Saloniste is visiting Paris right now and my friend Belinda Carlisle called me yesterday from New York in the middle of her press tour for her new memoir, Lips Unsealed. 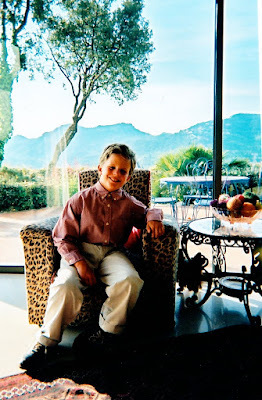 Belinda has made her home in the South of France for the last 12 years and after my son Luca was born, I would take a solo trip every year to stay with her for a week and relax, unwind and catch up that most precious of commodities for a new mother: sleep. I haven't been back there in about three years and I miss it. 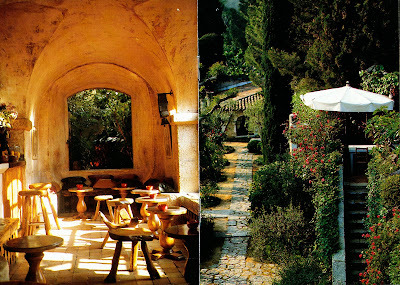 There is such a distinctive style to the French Riviera. Life there is so intimately connected with the outdoors, especially in summer, when the fertile seductiveness of the landscape and soft caresses of the sun bathe everything in an intoxicating charm. The word "langour" is derived from Old French, for obvious reasons. You just want to sit outside under an orange tree, feel the warm marine wind on your body and sip something iced and nectar-y. 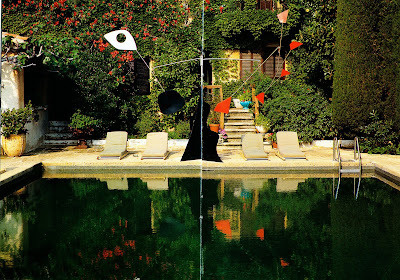 (Belinda and me by her pool, circa 2004? 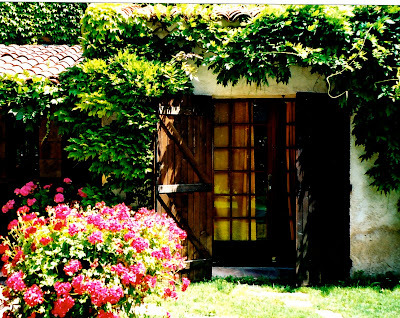 Belinda and her husband and son have lived in a variety of houses in the South of France and now happily reside in the hills of Provence. Here's a photo I took of their downstairs salon on one of my trips there. To me, it's a perfect example of Riviera Style. A massive sleigh daybed festooned with silk pillows anchors the center of the room and local flea market treasures rub shoulders with family heirlooms: the vintage hand-painted screen in the back (it's hard to see, but the style is very Ludwig Bemelsman), the Venetian mirror, the harp, and the wonderfully odd blue, green and white multi-lanterned lamp reveal Belinda's passion for color, history and the dolce vita lifestyle. 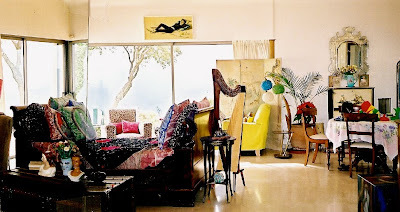 Vivid pieces like the yellow armchair, the vintage 1950's painting overhead and all those jewel-toned pillows (silkscreened with the faces of French aristocrats) make it both personal and approachable. In every house she lives in, there is always a leopard print somewhere (note the armchair). 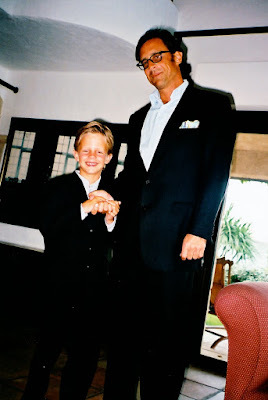 Her son James was about ten here and heading off to school; now he's a lovely and self-possessed 17 year old (and 6 feet tall!) and heading off to college in the fall. ...and then go back home where Belinda would waltz around the kitchen, barefoot and braceleted, with Bird, her parrot, offering vociferous comments from his safe perch on her shoulder. 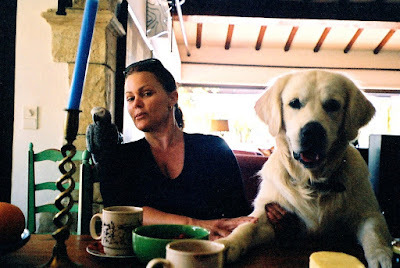 Afterwards we'd sit at the table and chew over the usual subjects: friends, books, travel and trying to live a meaningful life. 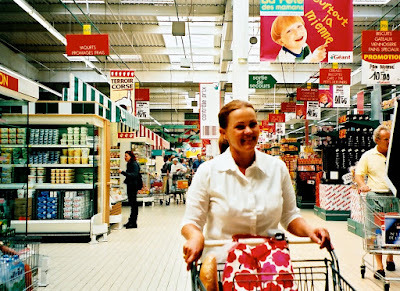 Even taking a trip to to the local Géant supermarket was fun: it's so enormous that the sales staff wear roller skates! I wish I had taken a picture of the cheese aisle -- it's the length of a football field. I will next time. Belinda is an intrepid road warrior, so my visits usually included a girls' road trip somewhere. 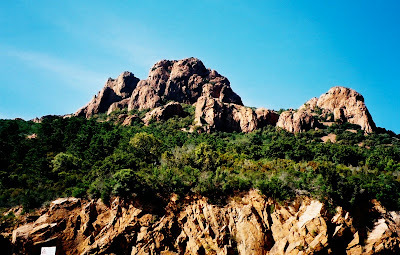 One year, we both became fascinated with the Knights Templar and went on a three day trip to Languedoc-Roussillon to explore a few of history's unsolved mysteries. Okay, we also went to some fun parties. 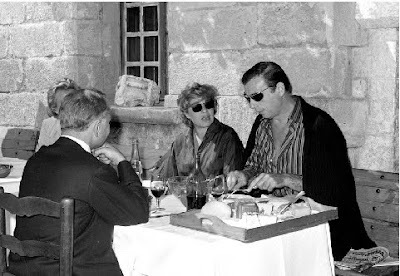 I took the photo below at Johnny Pigozzi's yearly luncheon during the Cannes Film Festival. We were all aflutter because Bono had just arrived. Even Belinda was moved to strike a pose. 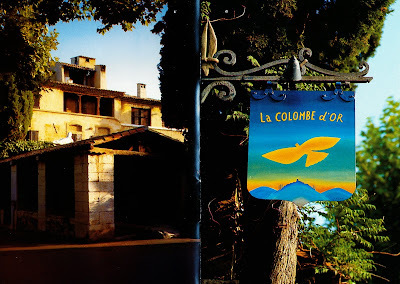 But no stay chez Carlisle/Mason was complete without a trip to the most enchanting restaurant on earth, La Columbe d'Or. ...La Columbe d'Or combines traditional gastronomy with a glamorous history, wonderful service and chic people-watching in one of the most romantic locales ever. Every artist, movie star and luminary from the last sixty years has eaten here. 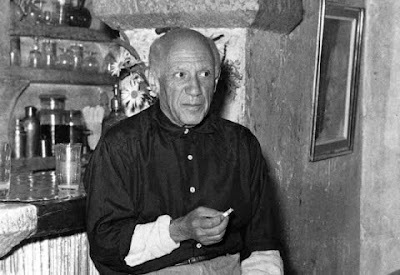 It's also a small luxury hotel; in fact, Picasso and Matisse lived here for a time and settled their bills in paintings (that worked out well for the owners, as you can imagine). As a result of this barter agreement, the artwork everywhere is astounding. I scanned a brochure from the restaurant to show you because the photographs do a wonderful job of capturing the magical feel of the place. 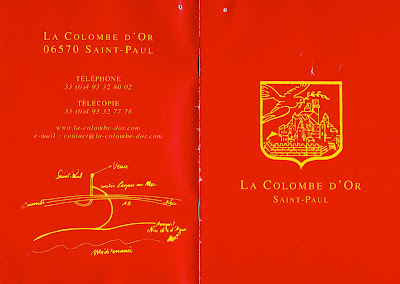 Last night, dipping into Dirk Bogarde's book of letters, "Ever Dirk", which has a permanent spot on my nightstand, I came across this memory of La Columbe d'Or. It says it all. Angela and Robin Fox [parents of English actors James and Edward Fox] came down to the Columbe d'Or with us...and at lunch on the terrace, the sun blazing, the mimosa great golden plumes, the almond blossom drifting in the soft wind...and the doves scattering in an arc of blue sky, Antonia said, "I think this is as near as I will ever get to Heaven." Which was rather nice. Here we are, all dressed up and on our way to one of our dinners there. I so enjoyed exploring your visits to your friend, what a joy and I LOVE the decor. My husband and daughter are there now, visiting les Grandparents! They will drive to le Luc demain to visit with his Taunte! I wish I were there....now. Your memories and times in France, vivre le France! JafaBrit's Art: She really does have incredible style in all aspects of her life. Oh how timely! I have four days unplanned in Europe coming up and have been toying with France. Now after reading this I'm absolutely set on France but just need to figure out where exactly. Thoughts on what might be fun? I just picked up Belinda's book today at Barnes and Noble. I was a huge fan back then and knowing that she was a good friend- I wanted to read more. I cannot wait to dig in. It sure sounds like Belinda is enjoying life and her family. What a wonderful personality! I good snippit in People as well. 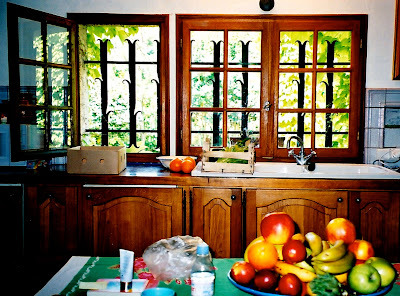 Those wistful days in France sound fabulous right now! I would guess that you are two lucky ladies to have one another to call friend. I need to know, did you solve any of history's mysteries about the Knights Templar? 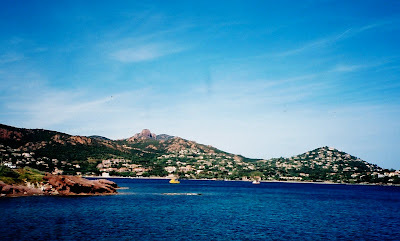 I know the south of France is big and all, but I was there in 04 too! What if we crossed paths!? Oh what fun! Beautiful picures, makes me want croissant and hot chocolate...immediatment! Tout suite! fabulous post, loved every minute of it. belinda seems just as i imagine her, a lot of fun, spirit and style. always admired her. I'm off there in a few weeks for my annual 2 weeks of glorious sunshine - you've just made me wish I were leaving tomorrow! A charmed life... 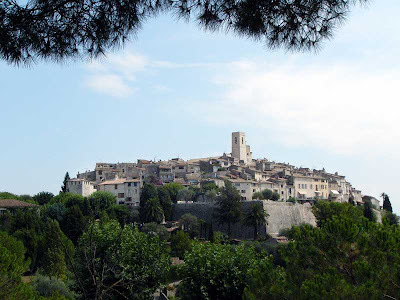 Wonderful Tour de Provence! Thank you for sharing such lovely photos. I feel like they, along with your prose, fully capture magical memories. Belinda C oozes style - as seen in her art and in her fashion choices. She is the reason I bobbed my hair in 1986! 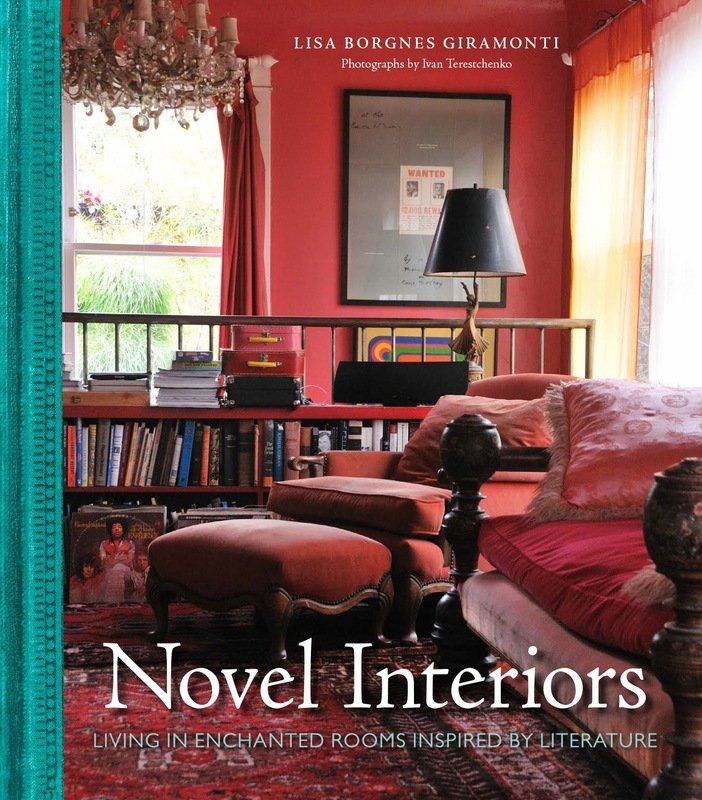 Nice to see her beautiful home and cannot wait to read the book. Enjoyed the article in yesterday's LA Times. 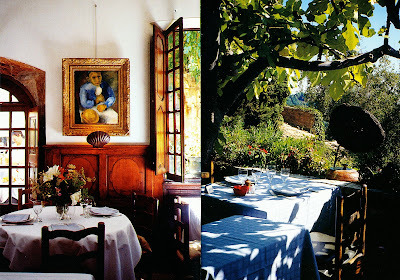 Le Colombe D'or is my favorite restaurant in france - love the salad at lunch beyond. I live for your posts - they are toooooo fab! Love the nostalgic slant to this...and I like how you've combined a personal sort of memory-blog with a travel post - the photos are amazing. I want to go France NOW!!! I already had her book down as one to read this summer! Love memoirs, and I have always loved her. Lucky you to know her! Beautiful pictures as always! Oh how gorgeous those photos and your memories, Lisa. Such a beautiful setting indeed for some R&R! 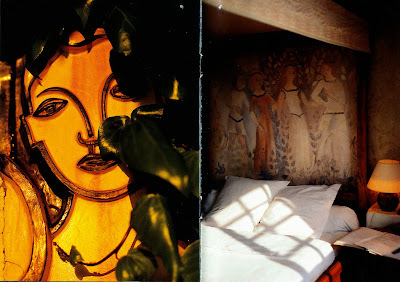 Enjoyed this peek into the house and surroundings of your friend, Belinda! Thanks for sharing it in your usual richly detailed, stylish and generous way. What fabulous images of a life very close to heaven!! How fun that we got to hang out with you and Belinda for a bit...what charmed lives! Thank you for sharing your friendship...I'm looking forward to a nice bit of reading time in the very near future with her new book in hand! Oddly enough I bought Summer Rain today on iTunes... how funny to then sit down and read your lovely post. It has lifted a rather ordinary grey day in NZ. Thanks! Popular Breitling Watches models include the: - Navitimer- Windrider- Professional- Aeromarine。There are many movements and calibers of Bentley Motors T , depending on which model you acquire. Navitimer World has used many types of movements and base movements over the years of creating watches and there are different Breitling Avenger movements. Nowadays, wedding Christian Shoes can be found not just on stores but also online. And there is not just one brand of shoes to choose from but hundreds of those. One of the most popular wedding Christian Louboutin Pumps that women are craving to have is the Christian Louboutin Boots wedding shoes. Just like Jimmy Choo, Christian Louboutin Sandals has also been captivating the heart of women through his wedding shoes. Even though Coach bags may be cheap compared to other designer bags, they are still relatively costly. One of the best ways to get a good Coach Ergo at a great price is to buy from an outlet store. 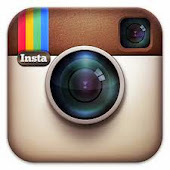 Outlet stores have become known for offering a really great prices on Coach Legacy . Buying a Coach Luggage in an outlet store is no exception. Fantastic. I met my french hubby 5 yrs agi and whilst we live in the alps.... we holiday in juans les pins where his grqan owns a wee studio. 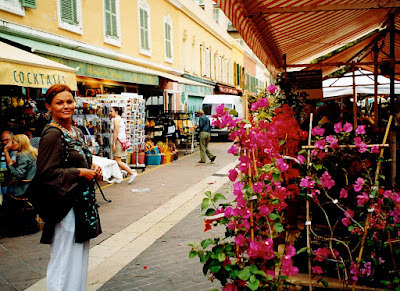 I love antibes... and Belinda Carlisle. Thanks for the post. Hope you have been back since.